I'm toying with the idea of widening the wheel base (using the FLM set) of my 5T and adding larger tires. What I want to find are tires that are preferably wider and taller than the stock 5T desert busters. They don't have to fit on HPI rims, I'm willing to use adapters to FG or some other rim style. My other question is, are the arms between the 5B and 5T completely interchangeable in terms of mounting? I'm pretty sure they are but I want to know if there are any nuances that could get in the way. Are you looking for wider and taller but still a buggy type tire, or are you looking for anything that is wider and taller? If you don't have a preference, the redcat rampage mt tires are the biggest I've seen so far. I haven't actually seen the 5t tires in person, but I'm guessing the rampage tires beat them in both width and height. Consider also the Smartech buggy wheels, they are only slightly larger diameter than the Baja 5B tires, but much fatter, they're actually a very good all-purpose tire as well. I would be happy to send you a used set to try. As for biggest and baddest, as above, it's the Redcat or the MCD monster tires, but on the 5T, I don't think you want to go any bigger than FG MT tires, do you? 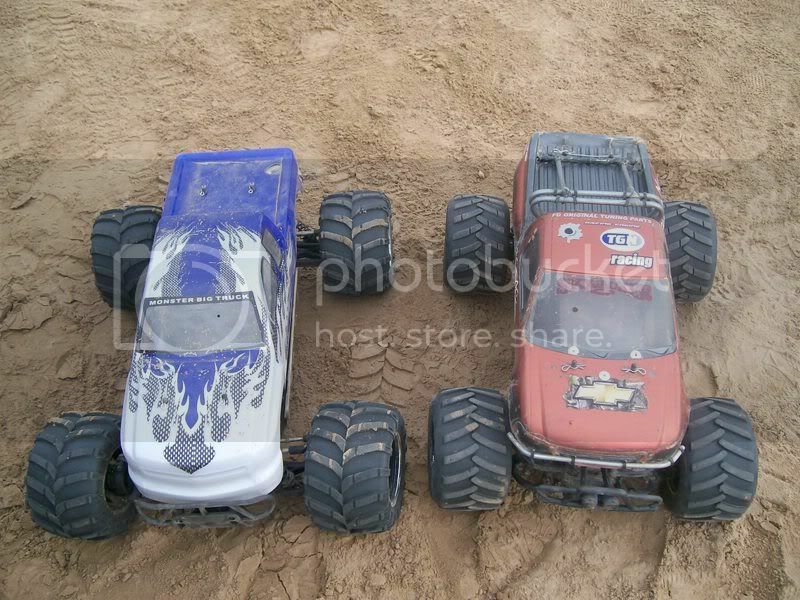 If you want to keep buggy style wheels and tires again the redcat buggy wheels are bigger and wider than most...look about the same as the thunderbolt but lower profile...maybe there should be a measure up so everyone can see to see whats what with various tires. I think the new proline excavators are a bit bigger than stock 5t tires too. Those ebay tires look promising, has anyone tried them? They're priced pretty well. Is the rubber and rim of decent quality? Otherwise I'd probably go with the MCD ones and some adapters. still waiting on confirmation about the arms as well. 22mm hex, they wont fit the baja hexes...you'd need adapters. i saw that the redcat tires are $90 on their website. i know there are fg adaptors for the baja and i can get fg tires for $70 a pair.